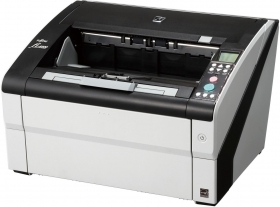 The fi-6400 is capable of digitising a variety of document types used in every scenario from ultra-thin receipts to thick document (20-209.3 gsm). In addition, this scanner is equipped with reliable "paper protection functions" to minimise the risk of documents being damaged even during the high speed scanning. Having a front loading feeding mechanism and low height compact design, the fi-6400 allows operators to perform scanning tasks while sitting at the desk. The scanner is designed to minimise the device's height to allow user to load and remove scanned documents with ease. These greatly reduce the stress of operator who tends to operate for long hours. The acclaimed "Intelligent multifeed function", which is available to our high-end models, simplifies pre-scanning preparation and improves efficiency by ignoring documents that tend to trigger false multifeed alerts, such as documents with intentionally attached photos and sticky notes.